These bracelets have beautiful Celtic designs. Bracelets are called bangles in Britain and Ireland. Please check the size of each piece carefully against a ruler before ordering. We give measurements of all jewelry pieces on this site so that you will know their size in advance; this will save disappointment, returning pieces, etc. BR1: Pewter twin-dragon bangle has interlacing design all around, with two facing animal heads at the terminals (see them roar at each other!). It is hinged at the center back, and has a pewter donut on a leather thong to close the bracelet at center front. Unlike the other bracelets shown, which are oval, this one is nearly circular in shape when closed. Note that this piece can be worn at the wrist or higher up on the arm, and size can be adjusted easily by moving the donut on the thong. 7/16" wide. We need the measurement of your hand (around its circumferance) because your hand has to be able to go through the bracelet to put it on. Large size is 3" in diameter when completely closed. Was $39. Sale price $29. We have one of these left. Small size is 2 1/8" in diameter when completely closed. Was $39. Sale price $29. We have one of these left. We are out of the medium size (2 1/2" in diameter when completely closed) and will not have more. BR2. This thick pewter bracelet with the bold interlace knots at the front is sure to draw envious looks from your Celtic friends! It's fairly large, but can be bent to make it larger or smaller to suit your wrist or forearm. Height of the front Celtic knots from tip to tip is 2"; width of the main part of the circle is 3/8". Was $41. Sale price $30. BR3. Wide interlace pewter bracelet is a great piece to wear to announce its presence! It's fairly large, but can be bent to change size. 1 1/8" wide. Was $44. Sale price $32. BR4. Flame design interlace Celtic pewter bracelet. This is a hinged bracelet, designed like the twin-beast one above (BR2) to close with a leather thong. Comes in three sizes: large, medium and small. Please state size when ordering. Large: about 3" in diameter with terminals touching. Was $39. Sale price $29. Medium: about 2 1/2" across measured with terminals touching Was $39. Sale price $29. Small: about 2 1/4" across measured with terminals touching, making bracelet oval shaped. Was $39. Sale price $29. BR5. Celtic knots bracelet will drape around your wrist. Each Celtic knot is 3/4" across; bracelet is 8" long overall. Made of polished pewter. Was $18. Sale price $13. BR6. 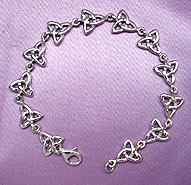 Sterling Celtic knots bracelet is composed of thick knots, each 7/16" across. Medium size. Was $50. Sale price $35. BR10. Solid sterling Celtic interlace bracelet unhooks for easy slipping on and off. Fits most wrists. Was $38. Sale price $30. BR11. Four-dragon pewter bracelet. The dragons intertwine around the circle of the bracelet. The inside measurement is just over 8 inches around; the band is 9/16" wide. Was $31. Sale price $26. BR14. Solid sterling bracelet is composed of eight claddagh pieces, each with Celtic knots on each side of it. The size is 7 3/8" around. Was $30. Sale price $23.